It brings us great pleasure to announce additional funding given by our non-profit, this time to one of South Florida’s premiere groups, Justin Bartlett Animal Rescue. Serving Palm Beach County, this all-volunteer enterprise operates an extensive network of foster parents who provide guardianship for both dogs and cats. Hot off the heels of creating another successful rescue group, Justin Bartlett Animal Rescue (JBAR) was officially established on April 2nd, 2012. Their mission is threefold: (1) to diminish the number of pets euthanized due to homelessness; (2) to educate the public about the importance of pet adoption; and (3) to promote spay-and-neuter programs. Their focus has always been on aiding animals who are pregnant or have recently given birth and are still nursing. The care of these creatures with puppies and kittens require significant resources and represent a weak spot for many county shelters. Regardless of condition or temperament, when these animals have lost all hope, JBAR arrives just in the nick of time. If there’s space available in their network, there’s a good chance these rescues will have a shot at a much improved life. The healing process is nothing short of extraordinary for many of these rescues, as you’ll soon see. Every animal they rescue is placed in a foster home, spayed or neutered, vaccinated, microchipped, receives a full medical work-up and then provided with necessary medical care. During this preparatory phase, supporters can sponsor a dog or cat, helping to defray these costs. After the animals recover from their respective traumas and are deemed healthy, they are judged ready for adoption. Until such time as a perfect match can be made, these pups and kitties remain under the watchful eye of devoted foster parents. Every month, JBAR’s volunteers expend their energies towards saving the lives of at least five pregnant or nursing mothers. To date, they’ve saved well over 2,000 dogs and cats! That’s amazing progress given that they’ve only been rescuing for just under two years. In the future, they hope to open their own low-cost spay-and-neuter clinic. Donald Wulff, JBAR Director, conveyed his group’s ‘thanks to the Dr. Jane’s HealthyPetNet Foundation for assisting us in making such a huge difference’ and for giving them ‘the opportunity to rescue some extra special dogs’. He added that, ‘without the support of companies like yours, we wouldn’t be able to save those in need’. 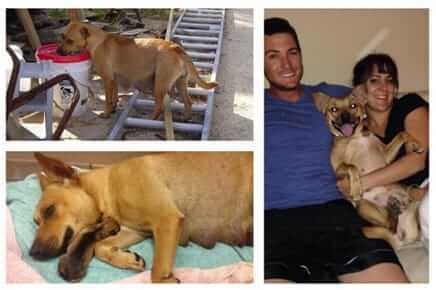 While in the Bahamas, a JBAR volunteer encountered a pregnant stray. Locals informed her that the homeless dog had previously given birth but that all of the pups perished without veterinary care. In an attempt to avoid a repeat of past tragedy, the group decided to fly the expecting mom stateside. Upon arrival, a previously undiagnosed blood disorder was detected, further increasing the precariousness of her pregnancy. In spite of the vet’s best efforts, Jezabel lost both puppies. However, thanks to the heroic efforts of her new caretakers, Jezabel has made a full recovery and is now happily ensconced in her new home with loving pet parents. By the time JBAR entered Bruiser’s life, this little tyke was an absolute wreck. 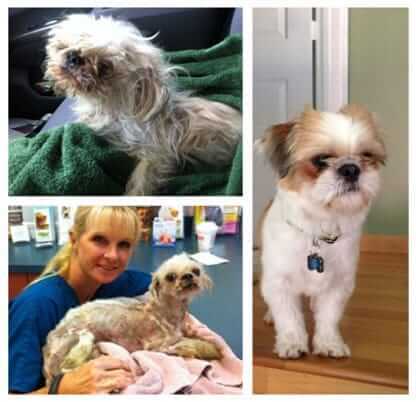 Emaciated from to the point of starvation and with fur matted with feces, Bruiser was running out of time in a kill shelter. Upon JBAR’s rescue, this now lucky fella found himself receiving urgent medical care, whereupon it was discovered that he was anemic and in immediate need of a blood transfusion. Thanks to his quality care, every day seemed to bring a new improvement, his strength growing bit by bit. Now, Bruiser is in tip-top shape and enjoying life in his new forever home! Left to languish in the heat of a Miami yard, Ophelia was underweight and her skin was covered in sores from demodectic mange. 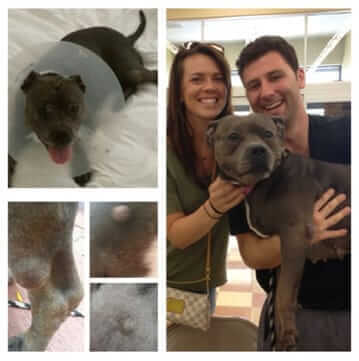 After weeks of treatment and special care, the lovely Ophelia is thriving with her foster family. She’s even had a brush with stardom, being the fortunate recipient of a training session with the famous ‘dog whisperer’, Cesar Millan. Anyone interested in adopting this lovable mutt should contact JBAR right away. 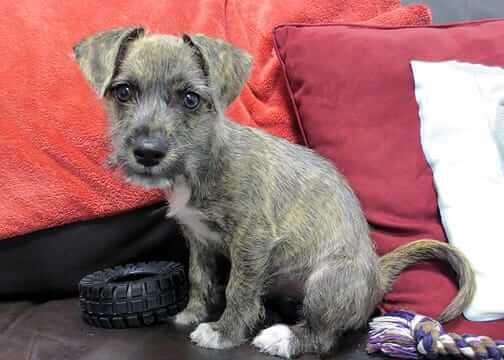 During an adoption event, a stray pup wondered in off the street. Volunteers described her as if she understood that they represented her best, and last hope for survival. Riddled with cancerous tumors and looking distressed, Petunia was in grave need of exactly the sort of assistance JBAR provides. Happily, the masses were removed and today, this beautiful pitbull is 100% cancer free. Even better, she just recently found her forever home! For diligence deserving of the highest praises, and for giving homeless dogs and cats a fighting chance, funding this grant was not only our pleasure but also our great honor. If you or someone you know would be interested in adopting a dog or cat in South Florida, we encourage you to contact Justin Bartlett Animal Rescue (justinbartlettanimalrescue.org). You never know … you could end up finding your new best friend! Dr. Jane’s Foundation has provided funding to animal rescue groups all over America since 2007. Our non-profit wing could not have achieved what it has without the continued patronage of our customers and the contributions of individual donors. On behalf of the thousands of animals who are now living in new forever homes thanks to Justin Bartlett, we thank you for caring enough to make a difference. I am very proud and honored to be supported by such great volunteers and fosters. Donations from great organizations such as Dr Janes make it all possible! LOVE hearing about the rescues who receive grants from the Dr. Jane Foundation. Knowing every purchase of Life's Abundance products helps to fund these grants makes my purchase even more important, keeping my rescues healthy and helps homeless animals. A truly win/win purchase! I am also very greatful to be a representative for such a wonderful company as Life's Abundance. I am looking forward to a long relationship! Every single day brings a different challenge in the world of JUSTIN BARTLETT ANIMAL RESCUE. There are good days and bad days. But every day can bring a rewarding feeling to your own life if you just reach out to make a difference. I promise you it will bring a smile to your face and a sense of wellbeing to your heart. Foster, Sponsor, Volunteer, Donate! You'll be glad you did. I'm so proud to be a part........this is an awesome organization. Won't you join us?